This is the second in the series of books which takes us with the next Mitford Sister playing a strong role, but of course the others especially Nancy heavily predominant in the first book make an appearance as well. However the story is related round Louisa Cannon who went to work for the Mitford’s in the first book escape her unpleasant Uncle. She works mainly in the nursery and becomes a chaperone for the sisters as they reach a certain age but she is till seen helping round the house in whatever role is necessary. A maid of all work I suppose. I really feel you need to know this background to Louisa as well as her sometime friend Guy Sullivan, a policeman wanting to make a name for himself. Without this prior knowledge i feel that you would be lost for the first third or so of the book – I was and had to go and do a quick recap of who was who. Once I had done this I settled into the book much easier. This time the focus is centred on Pamela Mitford the second sister, turning 18 and rather to be found out in the fields with horses, returning with no care for her appearance she is in contrast to her older sister Nancy who has embraced the 1920s and is certainly one of societies Bright Young Things. To bring Pamela into this circle, nancy arranges for one of her infamous treasure hunts to take place but it results in tragedy. One of the Bright Young Things; Adrian Curtis is found dead. Perhaps not well liked, but certainly no reason for him to have died. The killer is Dulcie a maid and an associate of Louisa Cannon. It all seems clear-cut until you start to find out about these Bright Young Things, their relationships and their connections to Alice Diamond. Alice Diamond is well-known and well-regarded amongst certain elements of the underworld in London in fact she is the Queen to the Forty Thieves. Rarely caught her method of distraction and working the shops as if she was as well-regarded as the Queen means that she is a name everyone knows…..especially Louisa. Again, Fellowes brings the fact into fiction and weaves it into a believable tale which had me intrigued how the criminal were flirting with the high society and getting away with it, until the day that Pamela and Nancy along with Louisa help reenact the evening of the murder to see if they can solve it. Aside from the slow start when you have to know who is who, once you get going this book moves along at a quite a pace and you see Pamela start to blossom and stand out from Nancy’s shadow. 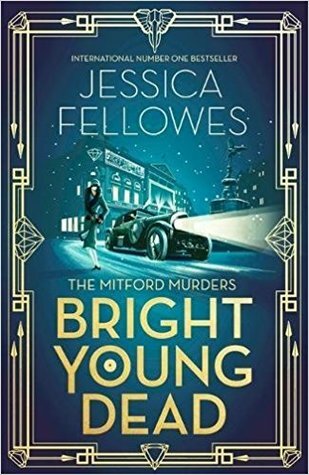 A great murder mystery which adds the elements of well-known people – both the Mitford’s and Alice Diamond (google her I had to – she did exist!) and creates a book worth reading and buying for all fans of good old-fashioned golden age murder mystery. I look forward to seeing where we go next as chronologically it should be Thomas Mitford but I feel it will concentrate on the sisters, so Diana next and I wonder who else I learn about in the process. Jessica Fellowes? Hm… well, what do you know? She’s Julian Fellowes niece (as in, author of Downton Abbey, Julian Fellowes)! She is indeed and also been deaf since a child.